On 4 February 2017, Black Sabbath walked off stage at the Genting Arena in their home city of Birmingham after the last show of their final tour. That heavy and emotional finale is captured on the forthcoming DVD, Blu-ray and album, The End. But they didn’t go their separate ways that night. 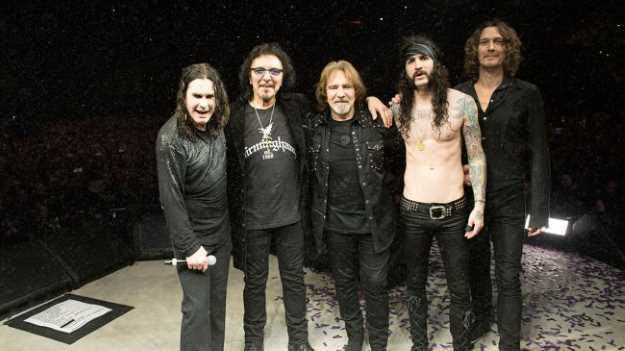 Instead, the band spent another three days together, finishing by going full circle with Tony Iommi, Ozzy Osbourne and Geezer Butler playing together in a room as they had began 49 years previously. 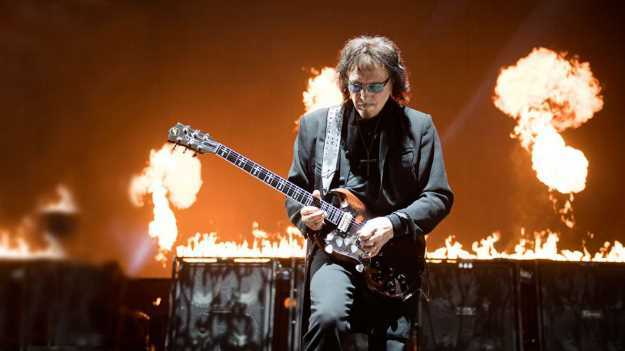 “It was actually my idea to do that,” Tony Iommi tells us as we meet in the grand Rocket Room of London’s Hospital Club. The intimate session at Angelic Studios in Northamptonshire with touring drummer Tommy Clufetos can also be seen on The End and sees the trio blasting through songs such as Wicked World and The Wizard from their seminal, self-titled 1969 debut album. Ozzy can even be found dusting down his harmonica for the latter as well as the unusual sight of Iommi and Butler on keys for a performance of ballad Changes from 1972’s Vol 4. “I had a totally different rig altogether for the last tour. I went to Laney and asked them if they would build a better (more reliable) version of the original amps I had years ago in the early days. They thought about it but they had only made a limited amount because they were expensive. “I didn’t realise it was going to be as involved as it was. They had a group of people to build these amps but they’d never seen [the originals], they were too young. So they had to be shown how to build each part. It was a lot more than I thought. They put a lot of effort into it to build them how I wanted. Which was great. So what exactly does the godfather of heavy look for in his sound? “Analogue is a lot warmer sound-wise. And they’ve tried to do it with the digital stuff and even now they can do it in analogue and convert it to digital. But there are pros and cons for both. The thing with analogue was if you wanted to cut a bit out you’d have to splice the tape and then put bits in. Now you just have to press a couple of buttons. “I think we’ve always had to deal with that. Ever since we started, the first day we had to deal with it. The same with producers. I remember when we first came to London, we played at the Speakeasy Club and we’d never played anything like that before. This guy was coming along from a record company and thought we were really crap. We never really appealed to anybody. So we’d plod on until we found the right thing and somebody would like it. “Eventually, it clicked and Phonogram got [producer] Rodger Bain involved, who was very new to them and it was like his test project I think. We knew nothing about recording so all we did was just walk in and play. The first album was like doing a gig for us. Literally, it took that long. We didn’t have weeks to work on it - it was a case of in and out. We might have Marvin and the Shads to thank for the evolution of heavy music! “The Shadows were the only band that really appealed to me [in the early 60s]. There was rock ’n’ roll but I liked the idea of an instrumental band and they had a real sort of demonic sound in some ways - Frightened City and stuff like that had an eerie feeling to it. I really liked what they were doing and they had a nice guitar sound for what they did. “So I really tried to get that and I did to a point. Bill and myself, when we got together we were playing Shadows songs in the early band we were in, with Cliff Richard stuff and rock ’n’ roll. We wanted this more raw, basic sound, so I got into playing blues and jazz. And from that it went into what we are playing now. “Geezer is irreplaceable... very important, because he would follow me and know what I was going to play. I never had any doubt at all that Geezer would play the right thing. Those kind of players don’t exist so much. I got a bit annoyed, certainly through the 80s period, that it became more about the posse of bands coming out. Having the bass down here and just hitting one note. Not players to me. “Geezer would come up with a melodic part and he was the ideal bass player for us. I think we brought out the best in each other. Because none of us were brilliant musicians but as a band it worked. We weren’t technically great but we played and we enjoyed what we did. We created a sound, and we created basic riffs that people liked. Well, we liked them anyway! “I did like to experiment a bit and I’ve always been one to try and do something different from what we’d already done. Even from the early days of doing an instrumental when we did Laguna Sunrise [from Vol 4]. Then Supertzsar [from 1975’s Sabotage] was another one. “Then I had a mellotron and put the choir [parts] down and it sort of worked. I played it the others and they said, ‘Oh yeah we like that.’ But the thing was we then had to get proper players in. So we had the choir come onboard. We got this harp player from the philharmonic and she asked, ‘Well, what would you like me to play?’ And I said. ‘I’m playing this [mimics rudimentary harp playing]’ I was so embarrassed. So I said, ‘Just play what you think will go with it.’ But it was all experimental. “You had to remember riffs back in the old days. When we did get a tape machine it was a big reel to reel but in the early days we’d have to keep playing the same thing so we’d remember it, because you’d forget. We’d rehearse again the next day and everyone would come in. You’d ask, ‘Does everyone remember it?’ ‘I think so...’ and you’d have to try and drum it into yourself but you might play it slightly differently. “That’s always the thing if you don’t tape it down, just that little inflection in how you play it can make the song sound different. Just pulling back too much or being too impatient with certain bits, it doesn’t sound the same. You’ve still got to play it the same to get that feel. “It’s a way of expressing your inner self. But I don’t sleep with the guitar now, when I did in the early days, mind! It has always meant something very special to me, and it brought out parts of me that you couldn’t bring out normally from within. “Being able to write music, being able to play an instrument releases something in you that you wouldn’t normally be able to do... that I wouldn’t normally be able to do. And the guitar did that for me. It taught me a lot really.